I’m adapting the Kindness Shawl pattern to make for an easier travel knit. All garter stitch with the eyelets in the main body. Not sure if I’ll go to a lacy pattern at the edge. This entry was posted in knit, knitting, pattern, shawl, travel, vacation, yarn and tagged knit, knitting, pattern, shawl, vacation by Patti_is_knittinginflashes. Bookmark the permalink. Please tell me that you aren’t still stuck on the highway! Heavens no! 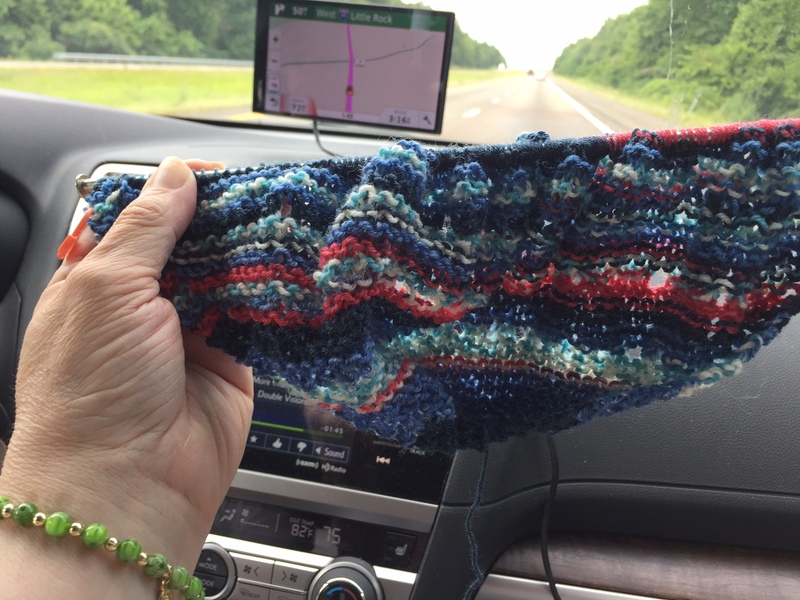 I was able to knit more while on the road. The first few rows require more concentration so I could get started. My posting abilities are very limited when traveling. Glad you got through it eventually! The shawl is going to be pretty.